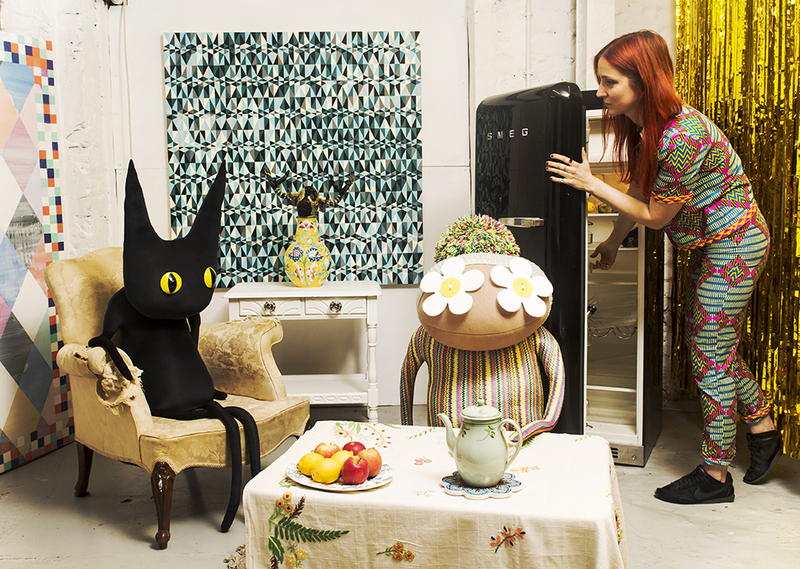 Developed from a love of craft, storytelling and weird characters, Ruby Ruth Dolls are a collection of colourful, eccentric creatures designed by Jenny Mustill. At Ruby Ruth Dolls, we believe that playing is for all. Although the colourful dolls are toy-like, they are predominantly bought by and for young adults who want to add character to their homes. The dolls are famed for their recycled materials, oversized button eyes and personable traits. Each creature is handmade in Brighton, England, by a small team led by Jenny Mustill, partly from recycled jumpers bought in charity shops. This makes each doll completely unique and enables the company to play a small part in reducing textile waste. The characters have names and biographies, connecting to customers on a deeper level. For example, Nigel loves Strictly Come Dancing and donning a sequin dress, Kevin has recently completed a BTEC course and Bella loves singing Dusty Springfield songs with her best friend. You can follow their adventures on our blog, as well as Facebook and Instagram accounts. Blogger and Youtuber Zoe Snugg's selfie with Ruby Ruth's own Malcolm and Rita. They have won the hearts of high profile customers including bloggers Hannah Michalak, Megan Ellaby and Zoe Sugg (known as Zoella). Zoe in particular has featured her own Malcolm and Rita in numerous videos, press features, an ITV advert and even alongside her waxwork at Madame Tussauds. We also have entered successful partnerships with brands such as Russell and Bromley who decorated their shop windows with Ruby Ruth's own Jasper cats for Halloween 2017. Ruby Ruth Dolls have evolved over ten years from their early appearances at markets and music festivals around the UK to being sent to customers all over the world. We are also stocked in over 15 shops around the UK and Europe. Ruby Ruth Dolls creator Jenny Mustill is a multidisciplinary artist who uses painting, writing and sewing as tools for self expression and to give an insight into her creative world. After completing a fine art painting degree at Chelsea School of Art Jenny worked as an assistant for Damien Hirst making his spot and butterfly gloss paintings. During this time Jenny was introduced to doll making by a friend. Jenny now runs the Ruby Ruth studio from beautiful Brighton. The characters that make up the Ruby Ruth range draw on Jenny's own experiences and her friends/family/pets/ people.